In my blog on Hillbilly Elegy, I asked for recommendations on a book that better explains our current regional voting patterns and two of you suggested American Nations. This is a very worthwhile read. American Nations traces the 11 ethoregional “nations” that actually compose our continent, from 1600 to 2010. (American Nations was published in 2011). Woodard writes the history of our country and our continent through the lens of these nations, which were colonized by different peoples, and have different values and often vastly different views on religion, race, the role of government, appropriate self-governance, diversity, social issues and the environment. And more! It is fascinating to read history told this way. It amazes me we ever came together as a “United” Sates. This is not an easy read. I typically could read only one or two chapters at a time. And since, as long-term leaders of Dusty Shelves know, I am not a fan of history, it took discipline and commitment to read this book. And retention? I would say I have retained 5% maybe. While American Nations does not address the current administration and how we were surprised last November 8, it does give us over 300 years of context for the decision we made as a country last year. Woodard is good, too, throughout his telling of history, at identifying what aspects are still alive today and still drive decisions and attitudes in the 21st century; so there is a frequent link to the present. American Nations is important and educational and yes, I highly recommend it. I am including the map of the 11 Nations here … I hope you will be able to see it! Based on an earlier conversation we had, I’ve requested this book at the library. I too was disappointed with Hillbilly Elegy. Looks this this book will provide a broader perspective. Thanks for the info Mary. I knew he had another book, but I thought it was earlier. I am goign to check out American Character also. Though Woodard’s primary focus is the US, I look forwrad to hearing what you think about his Canadian history bits as well. I’m glad that I made time to check out these book reviews/commentaries on your blog, Andrea. I was also disappointed in Hillbilly Elegy, mainly because it lacked the kind of insight that would have given me more compassion for hillbillies or the people who perceived Trump and his ilk as worthy of their vote. The book reinforced my view of two greatly disparate communities/cultures in the US, with an almost unbridgeable chasm. 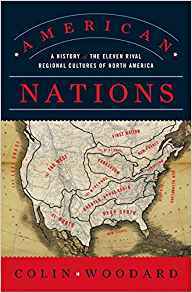 I look forward to reading American Nations for a cultural history of our “united” states. I look forwrad to reading you comments here again, Claire, once you have taken in American Nations. I loved this book! It was SO interesting to me. Unlike Andrea, I had no trouble sticking with it. I found that the narrative approach to history made it much less dry than other history books I’ve plodded through. I felt that it DID help me understand why so many people in the Far West, Deep South, and Appalachia largely went for Trump – they hate the Yankees and all we stand for. Like Andrea, I’m amazed that the US has stayed together all these years. 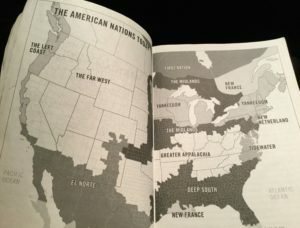 At the end of his book, Woodard refers to the Canadian response to the 2000 US election, saying that the North American continent should be split into Jesusland (the Deep South) and the United States of Canada. I’m coming to think that our country would have been better off if we could have let the Deep South secede peacefully. One last thing I found to heartily agree with and work to prevent: the vital need to “respect the fundamental tenets of our unlikely union.” Woodward lists some warning signs for the survival of our union: ending the separation of church and state (or “institute the Baptist equivalent of Sharia law”), appoint political ideologues to the Supreme Court (Gorsuch? ), or if party loyalists try to win elections by stopping people from voting instead of winning them over with their ideas.